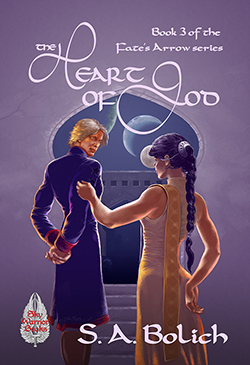 Words from Thin Air: Launch day for The Heart of God! It's launch day! I've been waiting for this one for months, because this is one of my favorite books in the Fate's Arrow series. A little lighter, a bit tongue-in-cheek in places, it's a blend of intrigue, vengeful gods, and romantic misunderstandings wherein our hero, Alarion, finally discovers girls. King Traven needs to find a wife, and leaves it to Alarion to pick the candidates. There's just one problem. Alarion knows nothing about women. Not to mention that Fate has certain plans of her own. I love this book because the reader is clued in to what everyone is thinking but the characters most emphatically are not, which makes for some humorous encounters and people working at cross-purposes with the noblest (and most despicable) of intentions. And poor Alarion: he hasn't the first clue how to dodge the amorous intentions of one of those women or hide his feelings from another. Did I mention that he is clueless about girls? I hope you will check out the Heart of God, which is available in both print and ebook today from Amazon and other outlets..